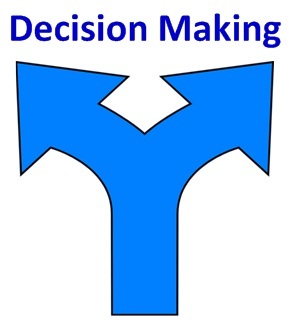 Decision-making is a process that involves the collection and analysis of information that results in the selection of a course of action among several alternatives. Effective decision-making may require a great deal of time, energy, thought, and information. But hopefully, the process produces a final choice that will be the best one to produce the desired results. Most people use some type of decision-making method when making bigger decisions on matters of importance or consequence. Although the process takes time and effort, the benefit is that the process sufficiently reduces uncertainty and doubt about alternatives to allow a reasonable choice to be made. The decision making process is a systematic approach which includes several steps. The process begins by defining the issues which needs a decision and determining what the decision should achieve. Information is then gathered and analyzed in order to develop alternative options. Finally, the alternatives are evaluated and a decision is made. Develop alternatives by thinking about or brainstorming possible options and solutions. We provide strategies and tools to help you make better decisions with tools and techniques for making timely and sound decisions including a SWOT analysis, Risk analysis, and decision making matrix.